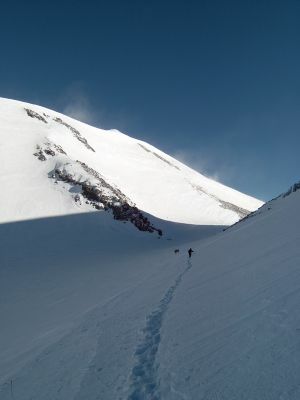 The next day the weather pattern repeats itself and we thus get the opportunity to do an acclimatization trip to 4900m in good weather - although we did experience strong westerly winds. Lotte on the acclimatization trip from camp 3 at 4400m to 4900m with the mountain chain towards Georgia in the background. 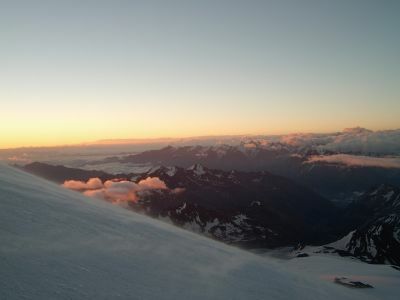 Hans on the acclimatization trip from camp 3 at 4400m to 4900m with the Elbrus peak in the foreground. At 2 am the alarm clock rings and a quick look outside the tent reveals that the weather pattern is still stable. The sky is cloudless and the winds are westerlies. 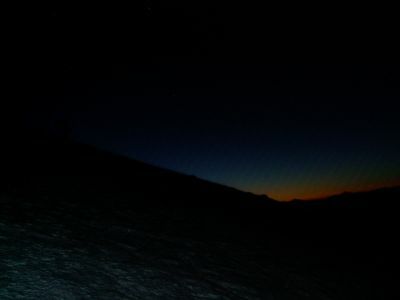 We decide to attempt the summit and at 3.30 am we leave our camp! Sunrise. Our summit attempt has begun. The sun is now above the horizon and paints the mountains and clouds in a brilliant red hue. 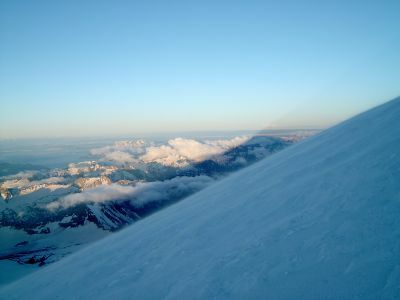 Elbrus throws its shadow toward the west. 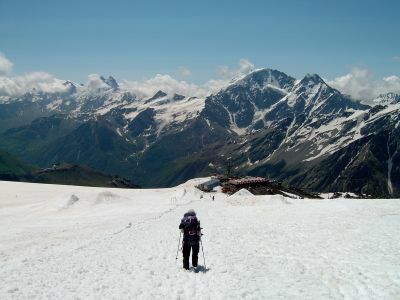 Lotte on "the traverse" above the Pastukhova Rocks and toward the saddle between the peaks of Elbrus. 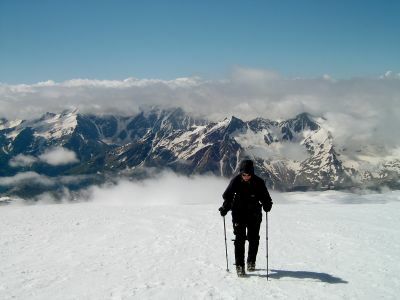 Lotte on her way toward the saddle (5416m) between the peaks. 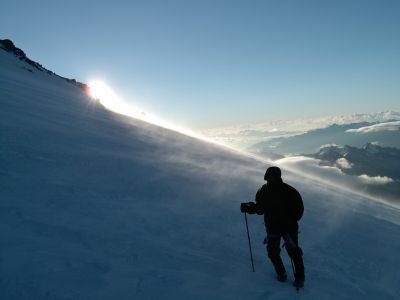 Finally we begin to walk without climbing so we get the chance to re-energize before the final steep ascent. The route contains almost vertically upward from Lotte's position until one moves behind the peak to continue. Snowdrift from the summit reveals how strong winds are up there! 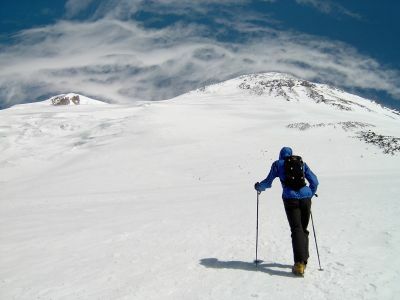 The route takes one from the saddle toward the summit, these leads to some unexpected peaks along the way. 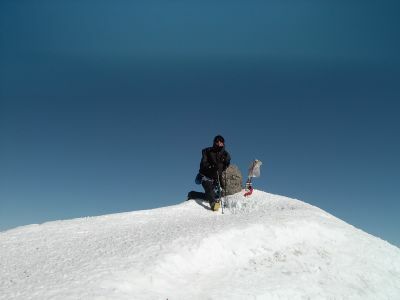 One is not in doubt when the final summit is reached as it is the largest and marked with stones, flags etc. What a view! Even though the clouds have now gathered below us we can see the Black Sea and mountain chains off to the south. An impressive sight. Because of the rapidly gathering clouds below us we quickly head downwards. At 1.30 pm and after 10 hours of walking we are back in out tent. 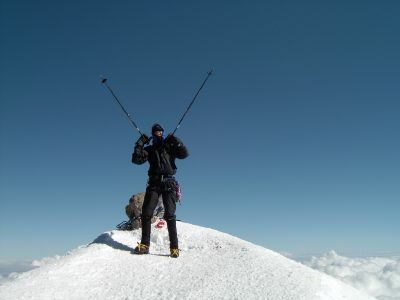 And now its Hans' turn on the summit.